Mira and her siblings celebrated their first Birthday today. For the very first time I have one of my own "puppies" at home. It has been a wonderful year in many ways, and I have many new experiences and memories. Keeping a puppy is special, and the bond I have with Mira is if possible even stronger than with my other dogs. We have been together everyday since the day that she was born. She has been raised by her mother Moa and halfsister Yaya, and I haven't had to do as much and as big of a job with her as with the others, they have done it for me. My other dogs has always been very attached and depending on me, but Mira is almost attached to my hip, in both good and bad meaning. She is a curious girl but also very depending on me, and gets very sad when I leave her, even if it is just for a minute! Of course it is a wonderful feeling to have a dog that loves you almost more than life! Mira and I have had a good year together. 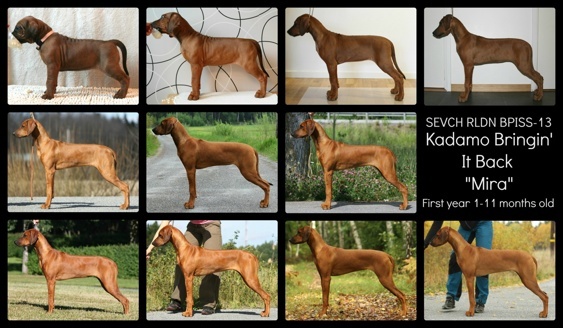 It started to her being shown in Puppyclass 9 times, below you can see how she placed at all those shows. But our highlights are most definetely being placed as BIS-1 Puppy at the International Show in Vänersborg under judge Ewa Nielsen, Sweden, and at the same time qualifing for Puppy of the Year 2013. The same weekend we had our second big highlight which was winning BISS Puppy at the SRRS Västras Ridgeback Speciality Show in Herrljunga judged by Mr Clayton Heathcock, USA. Not many weeks after that she placed as BPISS-13 at the huge Ridgeback Speciality Show in Höör judged by Mr Richard van Aken, South Africa. When Mira became 9 months old we stepped out of the showrings to let her grow up and focused on our bloodtracking and rallyobedience. Mira showed true talent in both fields and with minimum competitions she gained her Rally-O Noviceclass Diploma and her Swedish Bloodtracking Championtitle. I look forward to 2014 and what that year will have in store for us. Hopefully many fun things and some successful competitions too!